St. John’s senior Adham Floyd (14) attempts a shot in St. John’s 66-51 loss to Cambridge R&L on Saturday in the MIAA Division 1 state final. Floyd scored 15 of his 19 points in the first half, and hit four first-half 3-pointers. Floyd surpassed 1,000 career points in the first half. 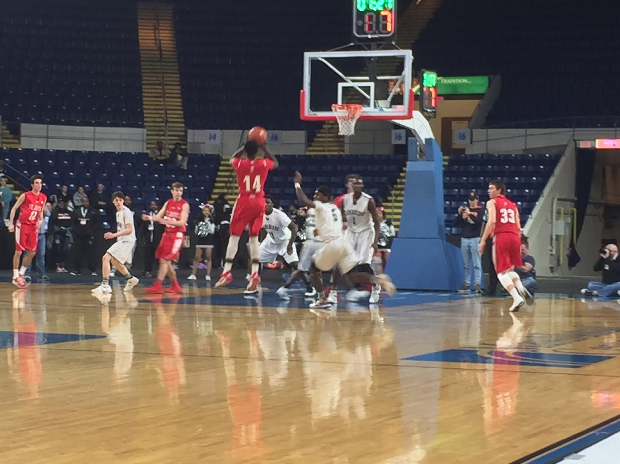 The Cambridge R&L Falcons used some stout second-half defense to pull away from the St. John’s (Shrewsbury) Pioneers, and win the MIAA Division 1 state championship, 66-51, on Saturday as the MassMutual Center in Springfield. Leading the Cambridge (24-1) defense was 6-foot-8-inch junior center Dimon Carrigan, who contributed 12 points, 10 rebounds, and 7 blocks to the Cambridge cause. Even on possessions when he did not block shots, his presence prevented Pioneer players from generating offense. Cambridge head coach Lance Dottin was very pleased with Dimon’s performance. “Dimon is the equalizer. He is the eraser… He protects everything at the rim, and he did a fabulous job tonight,” coach Dottin said, adding that he wanted his defense to “dig in” against St. John’s (24-2). Dimon and the defense did not have answers for Adham Floyd of St. John’s in the first half, however. Floyd found his shot early, hitting four 3-pointers and scoring 15 of his game-high 20 points in the first sixteen minutes. Floyd reached 1,000 career points with his second 3-pointer. “(Getting Adham Floyd involved) is part of our game plan every game,” said St. John’s head coach Bob Foley, adding that he thought Floyd “played very well” against Cambridge R&L. It was Floyd’s play that kept St. John’s in the game in the first half. Cambridge came out and got the ball to Carrigan, who scored five of Cambridge R&L's first seven points, helping the Falcons to jump out to an early 7-3 lead. Floyd and St. John’s responded and led 15-14 at the end of the first quarter. The teams traded baskets and missed opportunities in the second quarter. Midway through the quarter, both teams began to push the pace, but were unable to come away with points. St. John’s senior forward Nicholas Lukasevicz (10 points) and Cambridge R&L's Jakigh Dottin Mills (14 points, 7 rebounds, 3 assists) provided most of the scoring in the second period. St. John’s took a 27-26 lead into the locker room at halftime. In the third quarter, the Cambridge R&L defense took over. St. John’s first field goal of the second half came with 2:30 remaining in the third quarter. Junior guard Kareem Octavien, who added 9 points, shut down Adham Floyd. Coach Dottin was impressed with Octavien’s performance. “Kareem Octavien is one of the best on-ball defenders that we’ve had,” coach Dottin said of Octavien’s play on the offensive and defensive ends of the court. Coach Foley attributed his team’s stagnant second half offensive to the play of Dimon Carrigan. “We played well in the third quarter, but (Dimon Carrigan) is exceptional. We took the ball strong to the hole, and he put in back in our face,” Coach Foley said. St. John’s eked out eleven points in the third quarter and took a 9-point deficit into the fourth quarter. The Cambridge defense continued to have their way early in the fourth quarter. St. John’s scored four points in the first 5:19 of the fourth quarter. The Falcons extended their lead to as many as 18 before St. John’s began to incorporate a full-court press. The press was effective, especially for sophomore guard Tyler Mola, who collected two steals over the last three minutes to go along with 8 points. Unfortunately for the Pioneers, it was too little and too late. Adham Floyd fouled out with 2:53 remaining, and the Falcons finished it off with free throws. Coach Foley was very pleased with his team’s performance throughout the season. St. John’s loses only four seniors this offseason, though Floyd is among them. Having experienced playing in the state final could pay dividends in the upcoming seasons for St. John’s.